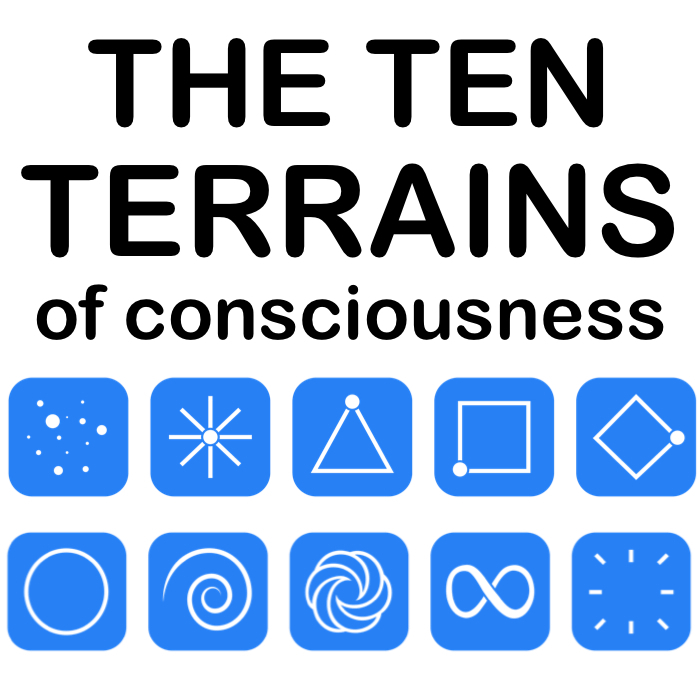 Welcome to the Ten Terrains™ of Consciousness. The Reed-Woolf Ten Terrains Model™ and Ten Terrains website hosted on tenterrains.com, are co-created by Allen David Reed and Tahnee Woolf (the Authors) in association with the Society For Collective Awakening (S4CA) (all hereinafter 'Website' and/or 'we/us/our'), for the purposes of Self-learning, personal empowerment, expansion of Consciousness and global healing, for the highest good of all. You understand and agree that by entering and using the Website you are entering into a license Agreement between S4CA and the Authors and you (hereafter party/ies) for access to and use of the Website and its content on tenterrains.com. You warrant that you are of legal age and legal capacity to bind into this Agreement. By reading or visiting any portion of the Website on tenterrains.com, you expressly agree that all of the applications, concepts, content, ideas, information, materials, services and website(s) 'art', design, graphics and text (collectively the Website) provided to you shall remain the sole property of S4CA and/or the Authors and is provided under temporary, revocable license for your personal, non-commercial use only. You will not use any of the Ten Terrains’ et. al. ideas or concepts in the Website to manipulate, entrap, exploit, judge, exclude or otherwise harm another person or living being. When sharing with anyone, you will not deliberately distort, modify, water down or in any way alter any concepts, ideas, information or other content of the Website. The Authors and S4CA are concerned about the security of personal information we may have collected from you and have taken reasonable steps to prevent unauthorized access to that information. We have been very diligent about installing a security system that honors the privacy of any personal information you give us and prevents unauthorized access to that information. As a condition for your continued use of this Website, you also are agreeing that S4CA and our other third party service providers may store information you provide (such as 'cookies') as part of your Website use. The Authors Allen David Reed and Tahnee Woolf and Society for Collective Awakening do not dispense medical, legal, financial, relationship or psychological advice or any other kind of advice, nor do they prescribe the use of any technique as a form of treatment for physical, emotional, or medical problems without the advice of a physician, either directly or indirectly. The Website is not intended to be, and should not be used as, a substitute for medical treatment by a health care professional or legal, financial or other professional advice. The intent of the Authors is only to offer information of a general nature and the Website is intended for educational purposes only. The Authors do not assume and hereby disclaim any liability to any party for any loss, damage, or disruption caused by errors or omissions in the Website and its content, whether such errors or omissions result from negligence, accident, or any other cause. By using the information presented and provided in the Website and/or any of its content, you agree to take FULL responsibility for yourself. Self-help requires intelligence, common sense, and the ability to take responsibility for your own actions. Information and content provided by the Website is only accurate for people who are at least seventy percent (70%) in charge of their own vehicle. By proceeding to enter and use the Website, and/or any other S4CA content, information or services, you are confirming that your Spirit is at least 70% in charge of your vehicle. S4CA or the Authors of the Website cannot guarantee the accuracy, completeness and validity of the Website information and content and cannot be held liable for any errors or omissions in it. Changes are periodically made to the Website and this WTOU Agreement and may be made by the Authors at any time. The Authors, S4CA or those associated with the Website do not accept any liability for any loss or damage whatsoever caused in reliance upon any information products or services in the Website. No part of the Website or its information (and products or services if applicable) on tenterrains.com may be reproduced by any mechanical, photographic or electronic process, or in the reviews, articles and certain other noncommercial uses permitted by copyright law. You may not copy, modify, distribute, transmit, display, perform, reproduce, publish, license, create derivative works from, transfer, or sell any information obtained from the Website or the information, products or services licensed therein, or any information provided by S4CA, the Authors, or our consultants, even for your own personal use—without the prior written permission of the Authors. For permission requests, email S4CA at “permissions [at] tenterrains [dot] com”. All material from the Website and provided to you as a result of your use of the Website is Copyright © 2015-2019 by Allen David Reed and Tahnee Woolf. All rights reserved Worldwide. Ten Terrains™, the Ten Terrains Of Consciousness™, the Reed-Woolf Ten Terrains Model™, the Ten Terrains Learning Community™, the Ten Terrains Resource Network™, the Reed-Woolf Terrain Analysis Questionnaire™, the Reed-Woolf Terrain Analysis Quiz™, the Ten Terrains Expert Assessment™, the Reed-Woolf Terrain Analysis Report™(s), the Reed-Woolf Terrain Analysis Guidebook™(s), and the Ten Terrains continuum of icons are trademarks and service marks of the Authors and/or Society for Collective Awakening and is/are protected under U.S. and International laws. Other names appearing in the Website, its information, products and services and elsewhere may be trademarks and service marks of the Authors and/or Society for Collective Awakening or trademarks and service marks of their respective owners. Advice received from the Website or its information (and products or services if applicable), should not be relied upon for personal, medical, legal or financial decisions. You should consult an appropriate professional for specific advice tailored to your situation. If you are not satisfied with the Website or its information (and products or services if applicable), our warranty to you, and the Limitation of our Liability, shall be to refund any contribution paid by you. NONE OF THE AUTHORS, S4CA AND/OR ITS RESPECTIVE SUPPLIERS, ANY THIRD PARTY CONTENT OR SERVICE PROVIDER OR THEIR RESPECTIVE AGENTS WARRANT THAT THE SERVICE OR THE WEBSITE OR ITS CONTENT WILL BE UNINTERRUPTED OR ERROR-FREE; NOR DO THE AUTHORS, S4CA AND/OR ITS RESPECTIVE SUPPLIERS, ANY THIRD PARTY CONTENT OR SERVICE PROVIDER OR THEIR RESPECTIVE AGENTS MAKE ANY WARRANTY AS TO THE RESULTS TO BE OBTAINED FROM USE OF THE PRODUCTS, SERVICES OR THE CONTENT IN THE WEBSITE; AND THE AUTHORS, S4CA AND/OR ITS RESPECTIVE SUPPLIERS, ANY THIRD PARTY CONTENT OR SERVICE PROVIDER OR THEIR RESPECTIVE AGENTS MAKE NO REPRESENTATIONS ABOUT THE SUITABILITY, RELIABILITY, TIMELINESS OR ACCURACY OF THE INFORMATION CONTAINED IN THE WEBSITE FOR ANY PURPOSE. ALL INFORMATION AND CONTENT IN THE WEBSITE IS PROVIDED ON AN "AS IS, AS AVAILABLE" BASIS WITHOUT WARRANTY OF ANY KIND. NONE OF THE AUTHORS, S4CA AND/OR ITS RESPECTIVE SUPPLIERS, THIRD PARTY CONTENT OR SERVICE PROVIDERS OR THEIR RESPECTIVE AGENTS MAKE ANY WARRANTIES OF ANY KIND, AND HEREBY DISCLAIM ALL WARRANTIES AND CONDITIONS WITH REGARD TO THE WEBSITE OR ANY INFORMATION PROVIDED (OTHER THAN AS STIPULATED ABOVE), EITHER EXPRESS OR IMPLIED, INCLUDING, WITHOUT LIMITATION, WARRANTIES OF TITLE OR IMPLIED WARRANTIES OF MERCHANTABILITY, FITNESS FOR A PARTICULAR PURPOSE, TITLE AND NON-INFRINGEMENT WITH RESPECT TO THE WEBSITE, ITS INFORMATION, PRODUCTS AND SERVICES AND ANY CONTENT OR ANY PRODUCTS OR SERVICES PROVIDED THROUGH THE AUTHORS OR S4CA. YOU EXPRESSLY AGREE THAT THE ENTIRE RISK AS TO THE QUALITY, PERFORMANCE AND RESULTS OF THE WEBSITE AND THE CONTENT THEREIN ON TENTERRAINS.COM, IS ASSUMED SOLELY BY YOU. IN NO EVENT SHALL THE AUTHORS, S4CA, BEINGHOOD EDUCATION PROJECT AND/OR ITS SUPPLIERS, THIRD PARTY SERVICE PROVIDERS OR THEIR RESPECTIVE AGENTS BE LIABLE FOR ANY DIRECT, INDIRECT, PUNITIVE, INCIDENTAL, SPECIAL, CONSEQUENTIAL, OR ANY OTHER DAMAGES WHATSOEVER INCLUDING, WITHOUT LIMITATION, DAMAGES FOR LOSS OF USE, DATA, SAVINGS, GOODWILL OR PROFITS ARISING OUT OF OR IN ANY WAY CONNECTED WITH THE USE OR PERFORMANCE OF THE WEBSITE OR ANY CONTENT, WITH THE DELAY OR INABILITY TO USE THE WEBSITE, OR FOR ANY INFORMATION, PRODUCTS, SOFTWARE OR SERVICES OBTAINED THROUGH THE WEBSITE, OR OTHERWISE ARISING OUT OF THE USE OF THE WEBSITE, WHETHER BASED ON CONTRACT, TORT, STRICT LIABILITY OR OTHERWISE, EVEN IF THE AUTHORS, S4CA OR ANY OF ITS SUPPLIERS, THIRD PARTY CONTENT AND SERVICE PROVIDERS OR THEIR RESPECTIVE AGENTS HAS BEEN ADVISED OF THE POSSIBILITY OF DAMAGES. You agree to indemnify, defend and hold the Authors, Society for Collective Awakening and our subsidiaries and service providers and Beinghood Education Project, including all members, officers, directors, owners, agents, content and service providers, affiliates and licensors (collectively, the ‘S4CA Party/ies’) harmless from and against any and all liability, losses, costs and expenses (including attorneys' fees) incurred by you in any manner for, or arising out of or in any way connected with your access to, use of the Website or tenterrains.com or any follow-up information provided. The S4CA Party/ies reserve the right, at its(their) own expense, to assume the exclusive defense and control of any matter otherwise subject to indemnification by you, and in such case, you agree to cooperate with the S4CA Party/ies defense of such claim. S4CA may need to share your information with third party service providers for the purpose of providing the Website to you, such as providers of technical infrastructure (such as servers or databases co-located with hosting providers), engineering, or other support. Ultimately it is true that data transmission over the Internet is never 100% secure, that the Authors and S4CA cannot warrant the security of any transmission you make with us and you do so at your own risk. The Website has put many security measures in place to protect the loss, misuse and alteration of the information under our control. However, you have a role in protecting your privacy. If you share a terminal with others, or if others have access to your information, we cannot be responsible for the security of your information. You may, of course, decline to submit information to the Website or tenterrains.com, in which case S4CA or the Authors may not be able to provide certain functionality, information, products or services to you. Protecting the privacy of young children is especially important. The Authors, S4CA or the Website does not knowingly collect or solicit personal information from anyone under the age of 13 (or under the age of 14 for anyone living in Spain or South Korea) or knowingly allow such persons access to the Website. If we become aware that we have collected personal information from a child under the relevant age without parental consent, we take steps to remove that information. If you have family, friends or colleagues who wish to discover their Terrain Of Consciousness, please send them to www.tenterrains.com/quiz.